Just 2 ingredients go in to making this Slow Cooker BBQ Chicken. It really is that simple, but it is too good not to share. 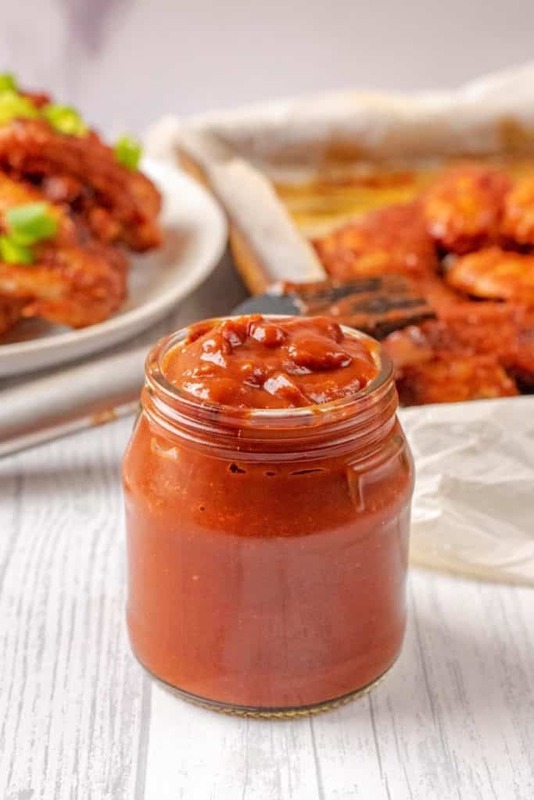 We have also included the recipe for your homemade healthier BBQ sauce too, and you are going to want to put it on everything. There is only a couple of weeks until our new book The Healthy Slow Cooker goes on sale and you can already pre-order it on Amazon. To celebrate, we are starting to share some of our favourite slow cooker recipes (some of which are in the book). Head over to Amazon and order yourself a copy! The great thing about slow cooker meals is that you just throw everything in and let it cook. Sometimes there is a little preparation required, like chopping or pre-cooking, but this Slow Cooked BBQ Chicken needs nothing else done. You just put the chicken breasts and BBQ sauce in the slow cooker bowl and put the lid on and cook. Done. The great thing about BBQ sauce is the sweetness. But I find store bought BBQ sauce to be way too sweet (the first ingredient is usually sugar), so by making it yourself you can adjust the sweetness. This recipe uses honey to sweeten it, but you can use maple syrup too. Also, we haven’t used any salt in this healthy BBQ sauce recipe, so it’s a good sauce alternative to give kids. We went through a stage with our toddler when she wanted sauce on all her meals and this made me feel much less guilty about it. This slow cooker chicken recipe uses chicken breasts to keep it really moist, but you could use chicken thighs or legs instead. Just be aware that cooking times will vary. Now you have made this delicious slow cooked BBQ chicken, what are you going to do with it? We sometimes keep it simple and just serve it with some rice, but it’s uses go far beyond that. Use it as the main ingredient in burritos and taco or stuff it in to a brioche burger bun with some homemade slaw – and some extra BBQ sauce of course! We have also put the leftovers on top of a salad with some avocado and used it as a pizza topping. One: Put the chicken breasts in the slow cooker dish. Two: Pour the BBQ sauce on top of the chicken breasts and mix. Cook on high for 3-4 hours or low for 7-8 hours. Three: Using two forks, shred the chicken and mix it all together. 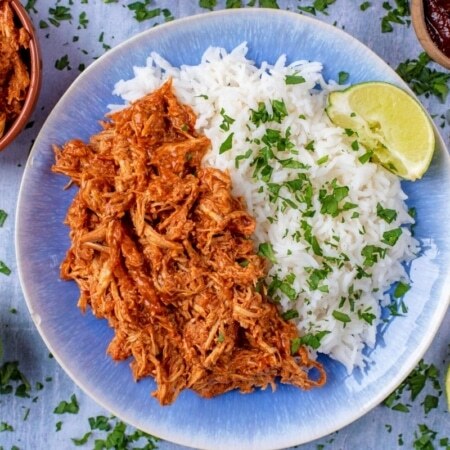 Add some extra flavour and texture to the slow cooker pulled chicken by putting some diced onion at the bottom of the slow cooker before you put the chicken breasts in. 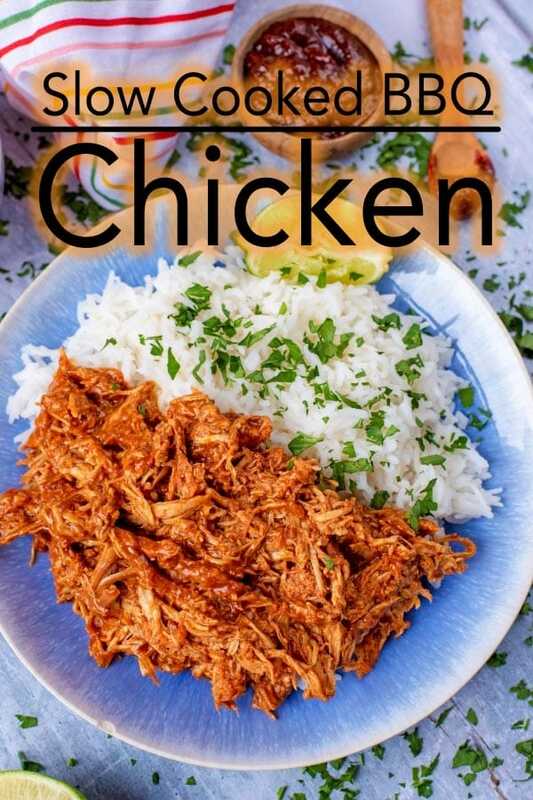 We have shredded the chicken, but you could always take the chicken breasts out and chop them and then add them back in to the bowl with the BBQ sauce. 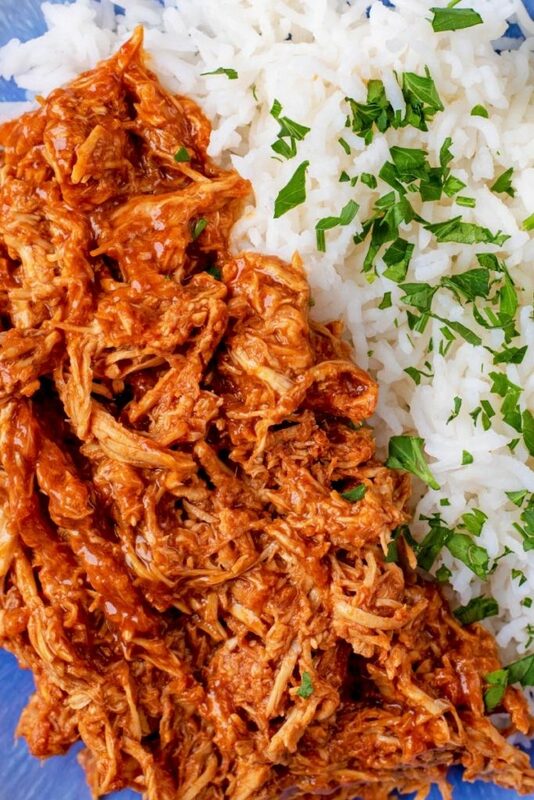 Serve the shredded chicken on rice, or use it as the filling for burritos and tacos. You could even put it on a pizza or salad. This BBQ chicken freezes well if you have some leftovers. Just pop it in a container and it will keep in the freezer for up to a month. We like to make this a little bit spicy and add some chipotle paste to the BBQ sauce. Do you want to be kept up to date on more delicious posts like this Slow Cooker BBQ Chicken? Please subscribe to the blog mailing list (it takes 30 seconds). 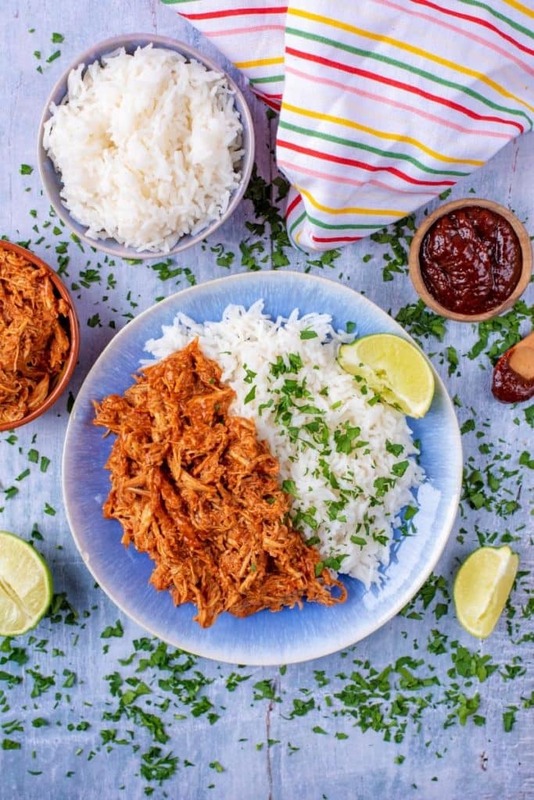 If you’ve tried this Slow Cooker Pulled Chicken, or any other recipe on the blog, then let us know how you got on in the comments below, we love hearing from you! You can also FOLLOW US on FACEBOOK, TWITTER, INSTAGRAM and PINTEREST to see more delicious recipe ideas, behind the scenes shots and also what we are getting up to. Just 2 ingredients go in to making this Slow Cooked BBQ Chicken. It really is that simple, but it is too good not to share. Put the chicken breasts in the slow cooker dish. Pour the BBQ sauce on top of the chicken breasts and mix. Using two forks, shred the chicken and mix it all together. Add some extra flavour and texture by putting some diced onion at the bottom of the slow cooker before you put the chicken breasts in. I doubt I would have any left to freeze. This is a recipe my family would quickly devour! Such an easy and tasty meal to make. The barbecue sauce sounds delicious, and so versatile. Always full of flavour and great to add to so many meals. Wow, could this be any easier. I am so busy and I love crock pot meals because they require very little prep. This would also be great in a sandwich. This does sound super easy to make and I love that you used homemade BBQ sauce. Will check out the recipe since I don’t like the overly sweet store bought brands either. 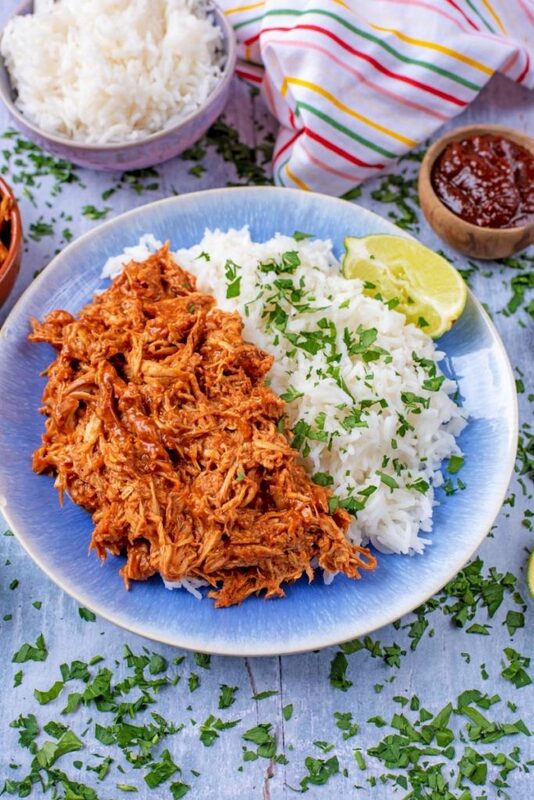 I love shredded bbq chicken! Slow cookers make life so easy because you can throw it all in and have an easy and delicious dinner with so little effort! What a fabulous meal idea! I’m always looking for a healthier bbq sauce and I can’t wait to try your version! This bbq chicken looks and sounds great. I love the idea of using homemade sauce and shredding the chicken to use in tacos or in a bun with slaw! this is a recipe everyone here would love to have on game day we all love barbecue in Florida its a big big part of the menu! This is such a great idea! It would be perfect for weekday lunches – love this! Oh God, what a tasty looking this Slow Cooked BBQ Chicken! I am in love with the colors and how simple and short the ingredient list is.Yum! Honestly, this REALLY appeals to me. I’m so much a simple recipe person. Can’t be doing with “must ensure a hundred different colours” and recipes with a million different ingredients. I’m trying to keep it super healthy, and trying to expand my recipe repertoire, but simple always works for me.. I love this recipe, and yes it is just so simple isnt it. I love making sauces at home and your sounds simply delicious!! Can’t wait to give it a try! !